Air pollution is turning the Taj Mahal, India's famed white-marble monument to love, a decidedly unromantic yellow. But as with many aging beauties, a therapeutic mud pack has been recommended to restore its natural allure. A report put before India's Parliament on Monday said that despite efforts taken by the government to preserve the 17th-century edifice, pollution was taking its toll, adding a "yellow tinge to the marble surface." The coloring was blamed on consistently high levels of "suspended particulate matter" - or tiny granules of dirt in the air - generally caused by burning fossil fuels and by dust. The committee based its findings on data from the Air Pollution Monitoring Laboratory in the city of Agra, set up to monitor the effects of air pollution on the iconic building. 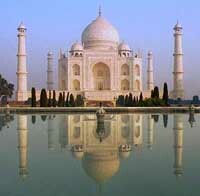 Agra, home of the Taj Mahal, is about 210 kilometers (130 miles) southeast of India's capital, New Delhi. Currently, to cut back on pollution, cars and buses are not allowed to drive to the Taj Mahal but must be parked at a lot about 2 kilometers (1.5 miles) away, where visitors can take battery-run buses or horse-drawn carriages to reach the monument. The report recommended applying a special mud pack to the building to restore its alabaster look. "To restore the pristine glory of the Taj Mahal, as a conservation measure, the clay pack treatment which is non-corrosive and nonabrasive (should be) carried out for the removal of the accretionary deposits," the report said. The treatment has already been done once but will need to be repeated every two or three years to keep the Taj Mahal white, superintendent P. Dayalan told the Associated Press Tuesday. The process, which takes about two months each time and involves caking the building in mud, letting it dry and then washing it off along with the dirty build up, costs some US$230,000 (EURO 170,000), said Dayalan, who is superintendent of the Archaeological Survey of India in Agra, which maintains the site. A garden has also been set up behind monument to try to absorb some of the particles, he said. The white-marbled domed monument was built by the Mogul Emperor Shah Jahan between 1632 and 1654 for his favorite wife, Mumtaz Mahal. It houses their graves and a mosque, as well as several other graves of lesser Mogul royalty. Some 3 million tourists visit the site every year.